AASRN member, Kevin Bathman, is part of the Asialink Leaders Program (a course to build capacity between Asia and Australia). He’s in the process of producing a book called Carnival of the Bold: Artist +Asia + Activism. Kevin’s seeking expressions of interest from socially-engaged Asian artist based in Asia and Australia who would like to be featured in this 120 page book. Socially-engaged Asian Australian artist with their roots from Bangladesh, China, India, Indonesia, Japan, Hong Kong, Malaysia, Philippines, Pakistan, South Korea, Singapore, Sri Lanka, Taiwan, Thailand and Vietnam. WHAT IS CARNIVAL OF THE BOLD? Carnival of the Bold provides a rare space for arts and cultural ‘change-makers’ to share their work and to inspire others through their stories. It provides a forum to explore new approaches and ways of thinking about thorny social issues, such as identity, cultural diversity, social change and environmental sustainability. The connections, exchange of ideas and dialogue generated within this space can be a catalyst for change, leading to real systemic change in our approach to complex issues. Artists bring interesting and unique perspectives to the mix, and engage audiences in new and different ways. They can strongly influence the way the world frames or feels about the social issues. Carnival of the Bold recognises the role of artists in being agents for socio-cultural change. It is interdisciplinary and inclusive of all artists – theatre, music, film, street performance and visual arts. 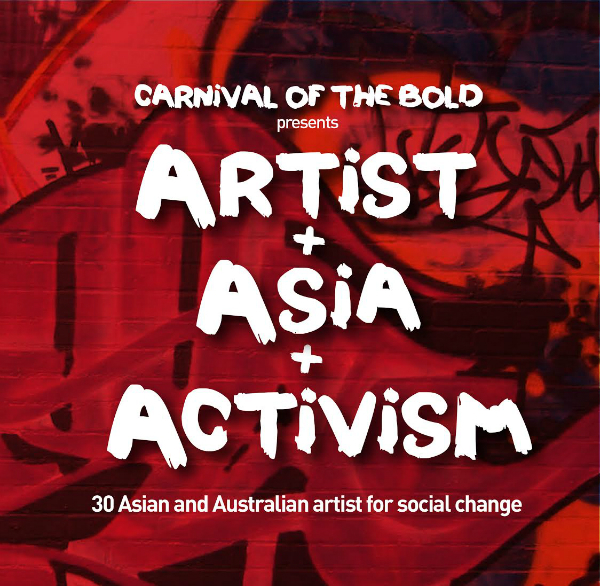 Carnival of the Bold: Artist + Asia + Activism seeks to champion the arts for social change in Asia and Australia. The 120-page book celebrates Asian artists who have used their art to inspire social change, enrich our cultural identity, explore shared values, spark imagination and empower communities. The printed book will be provided to arts and social change organisations as an educational tool on using the arts for social change. Showcasing a selection of their works, Carnival of the Bold: Artist + Asia + Activism seeks to shine a light on how the arts can bring change by connecting people who care about a better world. It is divided into two parts: Asian artist and Asian Australian artist. PART 1 highlights 15 diverse artists from fifteen Asian countries (Bangladesh, China, India, Indonesia, Japan, Hong Kong, Malaysia, Philippines, Pakistan, South Korea, Singapore, Sri Lanka, Taiwan, Thailand and Vietnam) who lead the ranks on the quest for social change with works highlighting various social issues. PART 2 highlights 15 diverse Asian Australian artist based in Australia (with their roots from Bangladesh, China, India, Indonesia, Japan, Hong Kong, Malaysia, Philippines, Pakistan, South Korea, Singapore, Sri Lanka, Taiwan, Thailand and Vietnam). As well as highlighting works on social issues, it will examine their diaspora links to their home countries. Interested? Email a brief bio and website to kevin@carnivalofthebold.com by 25th August.